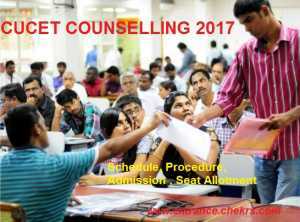 CUCET Counselling 2019 is going to be conducted by Central University tentatively in the month of June 2019. The process of CUCET admissions 2019 will be starting soon after the declaration of CUCET Results 2019. The Central University Counselling is going to be held by the individual universities and not through a single counselling process. Through CUCET Counselling Procedure 2019, candidates will be offered admission in the various Central Universities of the country situated in Haryana, Jammu, Jharkhand, Kashmir, Kerala, Punjab, Rajasthan and Tamil Nadu. in regards to more details of CUCET Counselling Scheule, go through the article and get precise details. Central University Counselling 2019 will be conducted after the declaration of CUCET 2019 results. Therefore all the eligible candidates who successfully qualify the entrance exam and make their way to the merit list will be called for CUCET Counselling Process which is soon going to be commenced on June 2019. The counselling session will take place online which includes the seat allotment followed by document verification round. In the process of CUCET admission, it is very essential for the candidates to keep track of CUCET important dates. You will be able to check cucet counselling dates 2019 as soon as possible. 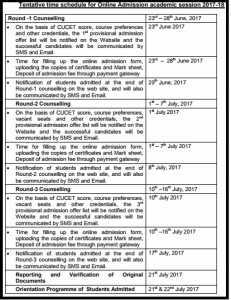 Check below the step by step details of CUCET admission procedure. Candidates must register themselves through its official website. The CUCET Counselling Form is available online and applicants must fill all the required details and complete the registration. After registration candidates can fill the choice of their course and college as per their preference. Candiadtes must bring the set of original documents and certificates along with a set of photocopies of the attested documents for verification purpose. The eligible candidates will be provided their seat at the end of the counselling session. The seat allotment process will be done as per candidates rank in CUCET 2019, upon candidates choice and as per availability. Aspirants must report on the allocated institution and further complete their admission process by submitting the fees. If any candidates fail to report on the scheduled date then hie/her seat will be cancelled. After the declaration of CUCET merit list, the eligible candidates must attend the counselling to complete the further process. Therefore applicants will be allocated their respective seats purely on the basis of candidate’s rank and availability of seats for the preferred course. After the commencement of counselling process, the Central University seat allotment results will be available, through which applicants are provided admission into their preferred course.